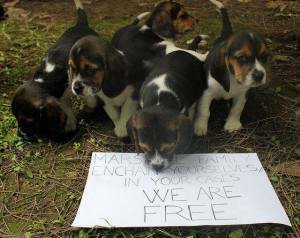 is a company located in Montichiari (Brescia), which breeds beagle dogs to vivisection labs. From this farm more than 250 dogs each month ending in the enclosures, in the hands of vivisection and operating tables. Dogs are born to die and sentenced to suffer. After the collapse of the other Italian breeder of laboratory beagle dogs, the Morini Stefano di San Polo d’Enza, it is likely that Green Hill has had a greater demand, expanding and becoming one of the main breeding dogs in the European market research animals. Inside the Green Hill 5 huts are locked up to 2500 adult dogs, plus several litters. A lager made of animal shelters closed, aseptic, without open spaces without natural light or air. Rows and rows of cages with artificial lighting and ventilation system are the environment in which these dogs grow before being loaded onto a truck and shipped to laboratories in hell. Among the clients of Green Hill, there are university laboratories, pharmaceutical companies and renowned trial centers as the notorious Huntingdon Life Sciences in England, the largest laboratory animal torture in Europe. Those who derive profit from this pain? For some years now Green Hill was acquired by an American firm called Marshall Farms Inc. Marshall is a name infamous throughout the world as it is the largest « factory » dog lab exists. The Marshall beagle is actually a standard variety. In this must also be seen that the expansion project includes the construction of other shelters in Montichiari, to arrive at Green Hill have 5,000 dogs on the farm, which would become the largest breeding beagle dogs in Europe. For a price from 450 to 900 � you can buy dogs of all ages. Who is willing to pay more can also buy a pregnant mother. Green Hill Farm and Marshall also offer its customers on demand surgical treatments, including the cutting or removal of the vocal cords of some glands. For Green Hill and Marshall Farm animals are just merchandise, objects to breed and sell, without the slightest scruple about pain and suffering, mental and physical, that will suffer.